You’ll get his Newsletter too! Why am I giving away this eBook? If you bought the paper version of the book, I want to give you a way to carry the book with you when on the road. If you do not own the paper version yet, I expect you’ll like the eBook and want to buy the paper version. This gives you a way to try it out. What do you get with the eBook? A PDF copy of the full book (all 122 pages) that you can load into your eBook reading device or view on your PC, Mac, or Tablet. DRM-free. A Free subscription to Michael’s Productivity Newsletter giving tips on workday effectiveness (you can unsubscribe at any time). The PDF eBook contains live links to many free streaming videos that demonstrate the powerful principles taught in the book. 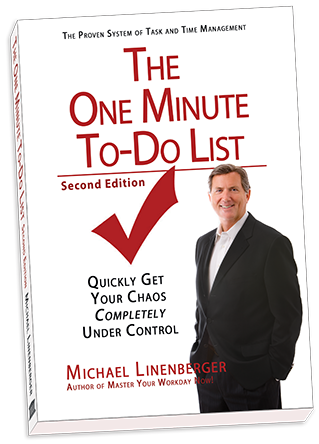 Michael Linenberger, author of seven best-selling books on workday productivity, presents the brand new second edition of his simplest and quickest guide to mastering your chaotic workday. I am telling everyone I know to get this book! In 60 short seconds I gained laser focus on what to be working on. I had no idea that it could be so simple to manage my hundreds of to-dos—what a feeling of relief and freedom that is! Marci Shimoff New York Times bestselling author of Love for No Reason, and Happy for No Reason. I read your 1MTD book last week while I was on vacation, then applied it when I got to work this past Monday morning. Wow, what a difference 1MTD made in keeping me on task while getting back into work mode. I cleared two weeks worth of emails from my inbox by mid afternoon, and every time I got pulled away from a project by phone/counter/staff, the high and normal priority lists kept me from being distracted/swamped by many less urgent tasks/requests! The #1 best-selling Outlook Book. Now in its fifth edition. Over 100,000 books sold! The #1 best-selling time management in Spring 2010, shows you how to get control, set goals, and find a passionate career.